Ssangyong Rexton is a large, spacious 4×4 for the price of a much smaller one, along with genuine off-road ability and butch looks. Ssangyong rexton powered by a 2.7-litre turbodiesel, Mercedes-Benz engine and with the Mercedes-Benz T-Tronic automatic gearbox as an option, the whole thing feels well put together. 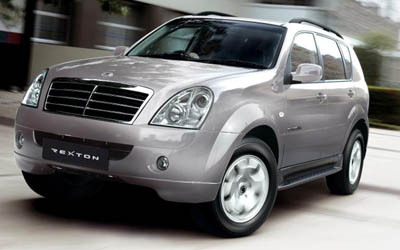 The Rexton’s rugged separate chassis construction means it is poor on-road. The slow-witted steering lacks feel and makes parking cumbersome, there’s a degree of lean through bends and the ride never really settles. A low-ratio transfer ’box and four-wheel drive help it feel at home in the rough. The diesel engine is harsh and noisy, because it needs working hard. On manual versions, the heavy, imprecise gearshift and long-travel pedals make it hard to drive smoothly. The front end is bulbous with a wide, deep bonnet fronted by a grille that looks as if it has been borrowed from an old E-class. However, that is no bad thing as it gives the car presence and prompts people to take a second look. Headroom is decent throughout, there’s plenty of legroom for front and rear passengers. Two further rear seats that allow you to carry seven people are available as an option. The boot is large, if not especially wide, and the rear seats fold and tumble to provide extra luggage space. The interior looks modern and solidly constructed. However, too many different materials are used, many of which look cheap. All versions comes with standard stability control and hill descent control. There is no traction control, and curtain airbags are not available. S versions do not even have front side airbags. There’s an alarm to deter thieves, however, plus standard stability control and hill descent control. Ssangyong Rexton’s running costs are high; the SPR returns only 30.7mpg and the S 31.4mpg. It needs to be serviced every 6000 miles. Resale values are also poor.